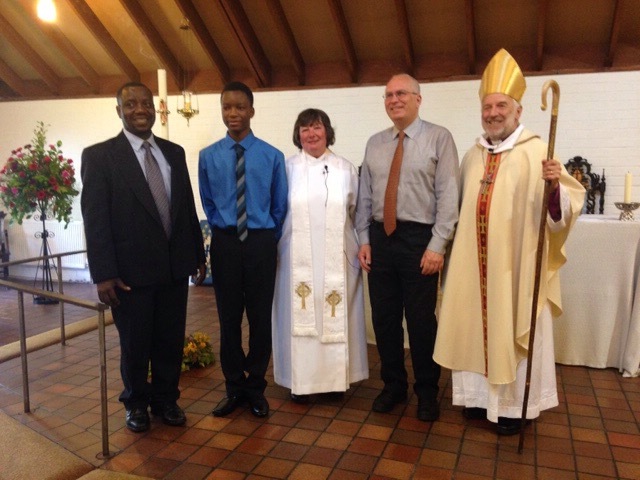 I seem to be in a season of Confirmations – this was the Confirmation of Cliff and Brian at St Peter’s, Kirkcaldy, today with Revd Christine Frazer. People can be a bit sniffy about Confirmation – ‘a rite in search of a theology’ is just the most obvious of the barbs. I share some of that. And I would be happy to see the last of the ‘rite of passage’ aspects of Confirmation – that would be dealt with most obviously by more teaching and more practice of the admission of children to Holy Communion before Confirmation. But Confirmation Services as I experience them aren’t particularly in search of anything. It’s often adults who want to make a specific faith commitment. Sometimes it’s people whose faith journey has been prodded into movement by something which has happened in their lives. And sometimes it’s people who have joined a congregation or moved from elsewhere to join the Piskies – and want to ‘do something’ to mark that move. Such people feel their Confirmation deeply – and so do I. And one more thing. You will know that I am keen to see our church move steadily beyond membership models of church to .. well ‘discipleship’ is a bit under attack at present as a concept. But Confirmation provides an opportunity of teaching about faith, about faith commitment, about the movement of the Spirit . in the life of the congregation. Not to be missed.